You are at:Home»Installation Advice»Should You Convert Your Open Fire into a Gas Fire? We know that open fires have their appeal. Cosying up around crackling flames on a cold day doesn’t get much better. However, not all of us have the time – or money – to give them everything they need. If your open fireplace is becoming more of a chore than a delight, it may be worth considering replacing it with a gas fire. By converting your open fire into a gas fire, you can save yourself time, money and contribute to a cleaner environment. Read on to find out more about the benefits of converting your open fire into a gas fire. Alternatively, click here to skip to our section on how to install one in your existing chimney. Surely nothing could be hotter than open flames dancing away in your room? While an open fire certainly looks as hot as you can get, the reality couldn’t be further away. Open fires burn up fuel quickly and inefficiently – in fact, they have an efficiency rating of just 30%! Gas fires, on the other hand, can be almost three times as efficient. While the flames may seem more subdued, they actually push more heat into your room. With an open fire, a lot of air is sucked in from your room and expelled through the chimney. This translates as less heating power! This isn’t the case with gas fires, as they are sealed with glass from the front, which provides radiant heat. They also provide convection heat by drawing in cold air and passing it over a heat exchanger before releasing it back into the room. Take a look at our high efficiency gas fires to find fires with an efficiency rating of up to 86%. You can find out more about which gas fires are most efficient here. Wood burning is not necessarily a bad thing. In fact, it is considered to be carbon neutral, as the carbon the fire gives out is offset by the oxygen released by the tree during its life. However, the method in which wood is burnt is what you may see coming under fire from environmentalists. When set in an open fireplace, wood burning gives off the highest amount of dangerous particles of any other domestic heating appliance. Gas fires, meanwhile, are one of the cleanest options we have available. Only electric fires can claim 100% efficiency and the highest level of cleanliness. However, gas has a much lower cost, meaning you can keep the air around your home cleaner for less. You can find out more about which type of fireplace is best to buy here. It’s an unfortunate fact that open fires get dirty quickly. Your chimney will need sweeping at least once a year and you will need to sweep up ash regularly. Gas fires, meanwhile, are much cleaner. The chimney will still need sweeping as a safety measure, though it will be less often and not so messy! Sourcing wood, storing it somewhere dry and making sure it doesn’t run out is an expensive and time consuming task. With a gas fire, you can easily switch it on without concerns for running out of fuel, and switch it off instantly whenever you’re warm enough. An open fire can have you feeling on edge around young children and pets. Embers and the possibility of chimney fires might also make you uncomfortable. Gas fireplaces are extremely safe, though you do want to make sure you have a carbon monoxide alarm. By now, you may have decided to move on from burning solid fuels. So, how you would go about installing a gas fire into your existing chimney? If you have had an operating wood or coal burning fireplace, you probably have a traditional Class 1 full depth chimney. However, to be sure, check our guide to choosing the right fire for your chimney and flue type. Make sure you measure the diameter of your flue and be sure your fire can fit. You should do this before you make any changes to your fireplace. This is always a good idea as you shouldn’t assume your chimney is in the best order before carrying out changes. A smoke test may be carried out to check for any leaks. Depending on the results of this, a flue liner may be needed. It is a legal requirement that a gas safe engineer fit your gas fireplace. They can also survey your room to make sure the fireplace you have chosen is suitable. It’s a good idea to hold off buying your fireplace until this point so you know everything is ready to go. 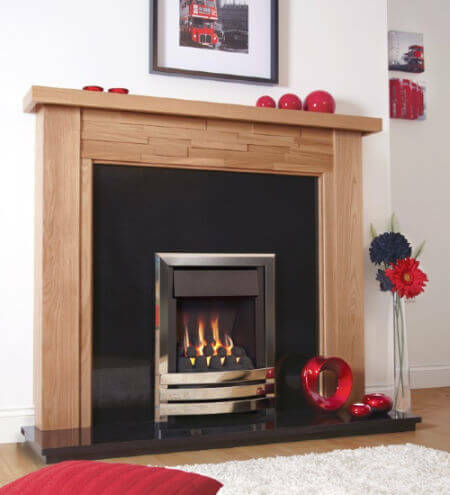 Read our blog on finding a qualified fireplace installer for some advice. An open fireplace should be big enough to fit a gas fire. However, if you have chosen a hole in the wall gas fire, a new hole will need knocking in and the previous one covered up. 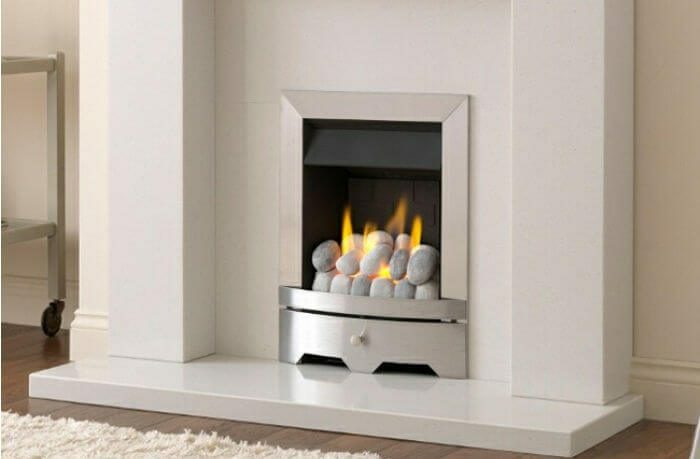 Read our hole in the wall gas fire buying guide for more. 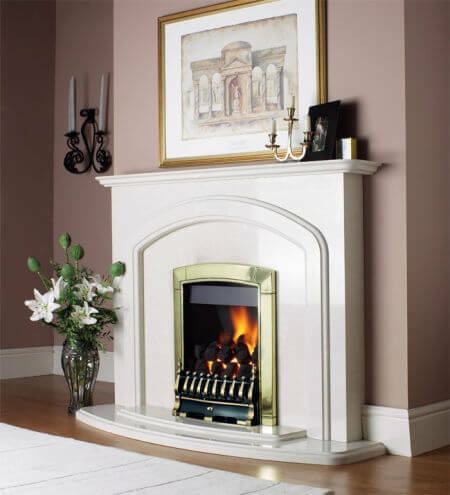 A hearth is a requirement for a gas fire, so be sure you have one ready along with your chosen back panel and surround. See our guide to buying the right hearth for your fireplace for more information. Your gas fire fitter will fit your fire and connect it to the gas pipe. They should also carry out a few checks for you to ensure no fumes are escaping. If you want to know more, you can find everything you need to know about gas fires here. If you would like any more help on buying your gas fireplace, contact us to speak to our expert sales team.